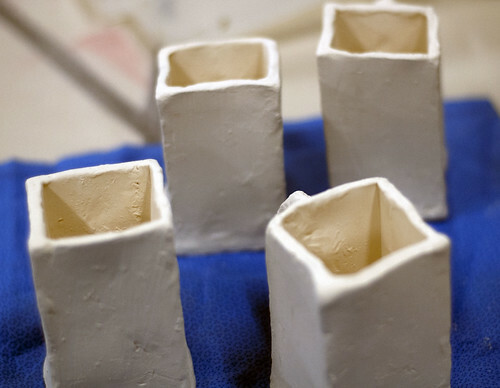 Introduction to designing and creating functional and/or sculptural work in ceramics, starting with a design idea, with the goal of finished glazed fired work. In-class demos and suggested projects will cover tools, studio safety, basic throwing on the wheel, clay slabs, clay extrusion, custom stamps and also basic glazing applications! Students are also highly encouraged to develop their own projects. Each class session offers demos and discussion as well as plenty of studio time to work on projects. You’ll only need to bring a 1 gallon bucket & a 1 gallon lidded container. Basic supplies provided; clay tools, stoneware clay, underglaze colors, and clear glaze (all food safe). Concurrent with your class enrollment, you can access the studio for a minimum of 6 hours per week for open studio to practice basic wheel and hand-building skills, complete projects, and to have fun! The specific open studio schedule for the term will be determined by the start of the class and will include some weekend daytime hours.